1952 year has significant importance in Nevsky Shipyard’s history. The management of North-Western River Shipping Company made decision to start shipbuilding on its production facilities. The Shipyard labours began to build motor vessels of “Leningradets” series for all industry. These vessels were able to sail under the bridges of Leningrad regardless of its drawing. The first vessel was launched in 1954. In total Nevsky Shipyard has built 18 such vessels. The enterprise has mastered the construction of oil vessels and barge for sand transportation. From 1952 to 2001 the Shipyard has built 260 vessels of different purposes and classes: small passengers’ vessels to tug boats and “river-sea” vessels. Serial shipbuilding became one of the main Shipyard activities. From 1966 Nevsky Shipyard started to carry our complete repair of marine engines for all enterprises of the European part of the country. The labours mastered steering hydraulic gears with the help of specialists of industrial scientific research institutes. 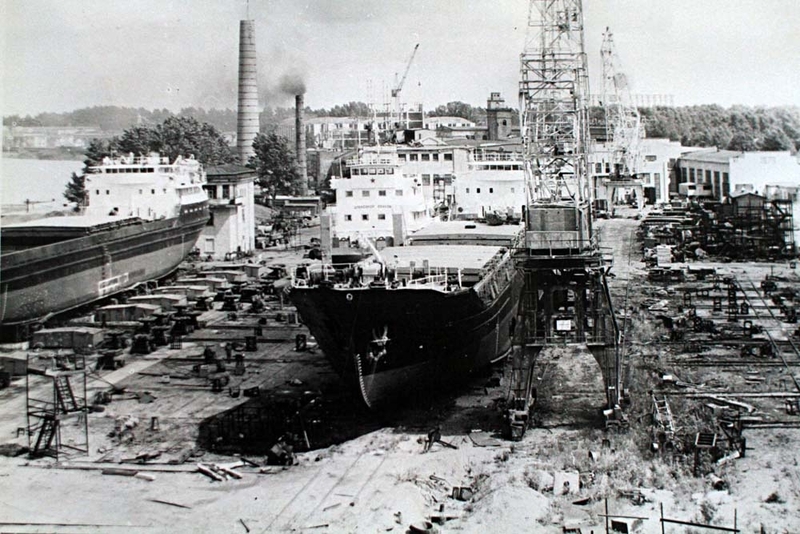 In cooperation with lifting and handling equipment plant the Shipyard started to produce unique in USSR slipway equipment – dollies and winches.